Last Friday saw the official launch at the International Travel Show TT Warsaw of three new tourist heritage trails across Poland’s Mazovian Province. The trails, which are accompanied by expertly-written guides available in four languages, a mobile app and dedicated website, are the latest in a line of initiatives of the Mazovian Regional Tourism Organisation, and part of an EU co-financed project entitled “Tourist trails of Mazovia’s cultural heritage”. The trails provide visitors with a wealth of information, and access to historic sights and monuments. 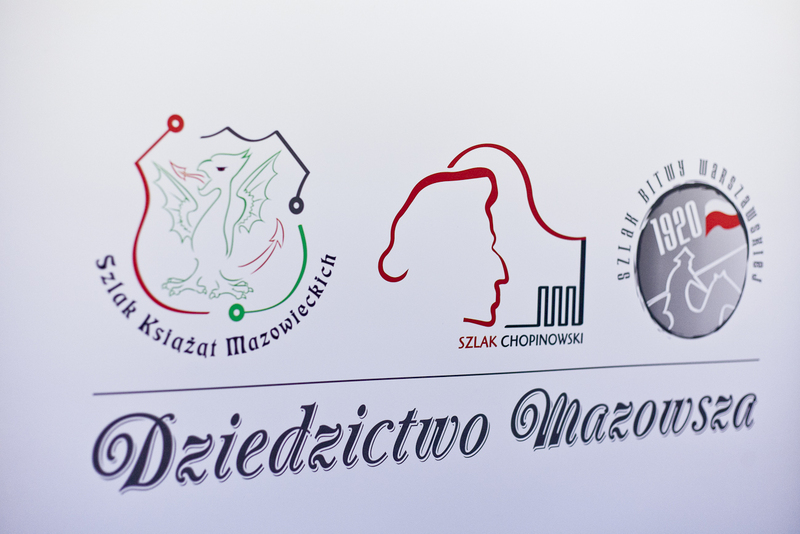 The first of the trails relates to the dukes and rulers of Mazovia during the middle ages, whilst the second is a two-part trail tracing the footsteps and life of Frederick Chopin during the first twenty years of his life in Poland. The third of the trails provides unrivalled insight into the events and places surrounding the battle on the Vistula in 1920 when Poland’s newly formed army, through a series of spectacular military victories, saw off the threat of the Soviet Bolsheviks, and in doing so changed the course of twentieth century European history. 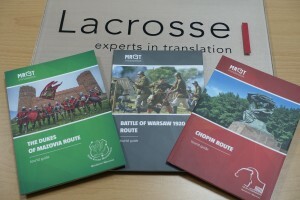 Lacrosse is proud to have been involved in this prestigious project, through its work on preparing versions of the accompanying guides and information boards on the route of the trails, into English, German and Russian, so that as many foreign visitors as possible will be able to enjoy to the maximum the many cultural and historical attractions of the region. 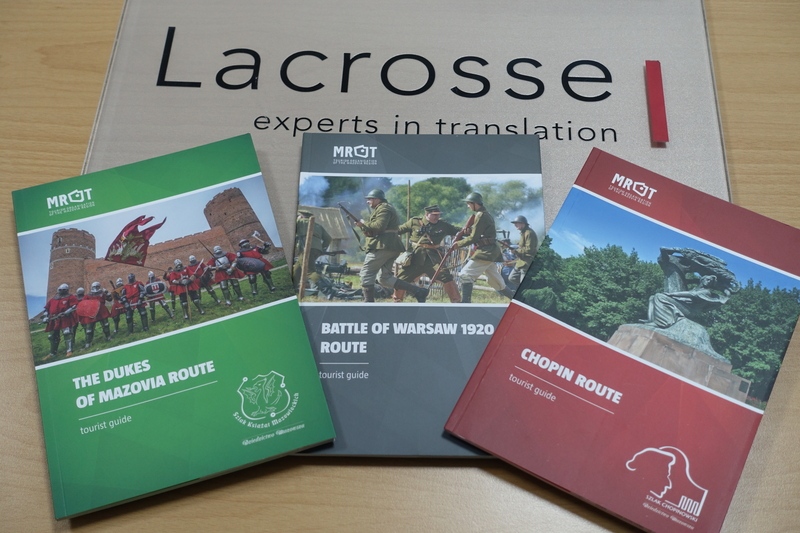 The Guides received a commendation at a recent competition – Regional Roses 2015, and are considered to be among the best regional guides in Poland at present. The awards were announced in October at the “Tour Salon” Fairs in Poznan. We are also very proud to be able to say that the Chopin guides in the four language versions available already made a great impact and were enthusiastically received by visitors from across the globe who attended the XVII edition of the International Chopin Competition held in Warsaw in October. As a result of this tremendous initiative, Mazovia now has over 1000 kilometres of dedicated themed cultural tourism trails, there are a total of 36,000 guides available in Polish, English, German and Russian, 400 road signs indicating the trails, 100 information boards along the routes, 60 monuments dedicated to the trails, a mobile app and dedicated website – www.dziedzictwomazowsza.pl , and a programme in place to promote and develop the tourist trails and the cultural heritage of the region. We encourage you to spend some of your free time in this region, and to learn about its rich historical and cultural treasures! Uncategorized Chopin Route, Cud Nad Wisla, language service provider, Language services, Poland, translation for tourism. permalink.